Guillaume has a 15-year experience in the real estate industry and is Managing Partner at FARO CAPITAL PARTNERS, a boutique real estate investment and asset management company. He held senior positions at AEW and CBRE Global Investors from 2006 to 2017. When at AEW, he was head of offices asset management, in charge of AM and disposals for France, Benelux and Spain. He managed a Pan-European portfolio with a total value of c. €7 bn with a team of 14 professionals. Guillaume was notably involved in acquisitions strategies, investments committees, investors’ relations and was a member of the firm’s European Management Committee. Prior to joining AEW, Guillaume was a Director/Fund Principal at CBRE Global Investors within the Strategic Partners Europe Funds series, opportunistic/value added real estate funds over the Eurozone countries. 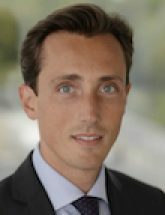 Before that, Guillaume was an analyst at Deloitte Finance, within the Real Estate Advisory and M&A departments. Fellow member of the RICS, Guillaume holds a Master’s Degree in Civil Engineering from ESTP School and a Master’s Degree in Finance and Real Estate from Paris Dauphine University – where he is also a teacher in Paris and Casablanca.